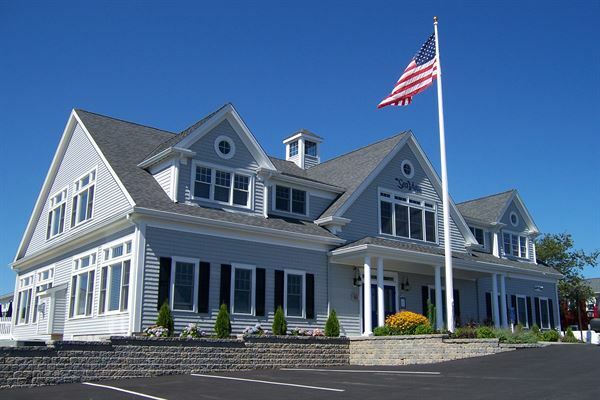 A modern, yet elegant facility designed in the architectural tradition of Cape Cod, with a variety of rooms to suit private functions of all kinds. Signature features include the two-story Grand Foyer, with picturesque staircase and chandelier. The spacious Lounge boasts a gas fireplace and a magnificent twenty-nine foot mahogany bar. The Main Dining Room can seat as many as 220 guests, with a very flexible seating plan. Our Outdoor Terrace overlooks sixteen acres of lush conservation land and a beautiful pond.